Track racing once dominated Australian sport and was still going strong up to the last quarter of the twentieth century. Today we're presented with a watered down version where Australia's elite track riders still perform well, but the vibrant track scene where all day track carnivals, which ran late into the night, attended by hundreds or thousands have become a thing of the past. The demise of some of Australia's popular tracks and the loss of support from local community groups offers some clues as to how this gradual shift occurred, resulting in the current underwhelming Australian track racing scene. From the middle of the twentieth century, many organisations which previously supported cycling events and their venues, bowed out one by one. When these vital affiliations ended so too did many of the races and the race tracks which they'd once promoted. Some remained however, as a result of local enthusiasm for cycle sport alone. Hunt around the back streets of Australia's country towns and remnants of old bicycle racing tracks are there waiting to be found. Relics of a by-gone era these tracks existed in towns with permanent populations sometimes numbering only hundreds, come race day though, thousands attended multi-sport events. One example - Gilgai Sports, held on boxing day each year, boasted it's 70th annual event in 1964, this carnival no longer exists. Throughout the decades Gilgai Sports had hosted races like the 1932 professional three quarter mile championship of New South Wales. Visit Gilgai today, all you'll find is an abandoned dirt track. Australia's bike racing tracks are as many and varied as the towns themselves, from dirt tracks around showgrounds to fully banked concrete and bitumen surfaced velodromes. Some tracks have remained unscathed - still in use, others like Brisbane's Hawthorne Park demolished, some left baking under the hot Australian sun and others obscured, waiting to be found if you know where to look. Starting with the Glen Innes "Cycling Arena" as it was known in the 1970's, this series of articles will take an in depth look at a number of Australian cycling tracks, how they came to exist, what state they are in now and how this contributed to the demise of track cycling as a community and family day out in Australia. First an overview. At the community level track racing in Australia always revolved around a way of life, a family day out, B.M.X is now the nearest modern equivalent. Anyone who was around the country tracks of Australia in the 1960's, 70's, and 80's will remember parking their car up adjacent to the track then settling in for a race programme that went on into the night. Almost erased from living memory though was how this style of all day racing came about. It's all in a word : "SPORTS"
Cycling clubs in Australia have always promoted racing carnivals, before the middle of the twentieth century there was also a large number of cycling promoters from other organisations. These organisations promoted multi-sport events, often in conjunction with the local independent sporting associations like cycling or running clubs. Some running clubs promoted cycling events on their race programmes. Many cyclists also took part in other sports, some boxed, played football, or were runners. Brisbane's Arthur Dowse is an example of this breed of cyclist, Arthur boxed and was a keen runner. Racing at Gilgai was often billed as "Gilgai Sports", multi-sport events, and events were organised by the Gilgai Sports Club, the cycle sports they organised were held in conjunction with the local cycle club. In 1910, motorcycle races were even included on the programme at Gilgai, where an Inverell motor cyclist was killed, trying to avoid spectators who'd walked onto the track. Echuca's popular Boxing Day Carnival was organised by the Echuca Athletic Association. A register of Christmas Carnivals for 1937 reveals that the Gundagai Sports Club, Coolamon Sports Club, Westbury Sports Club, Irishtown Sports, Burnie Athletic Club, Devonport Athletic Club all ran Christmas "Sports" carnivals with cycling on the programme. Other "Sports" promoters included Caledonian Clubs, The Australian Natives Association and local Friendly Societies. Together with local councils these organisations breathed life into community events which included cycle racing. These sports organisations also pitched in alongside councils and governments, to help raise funds and provided labour to build and maintain velodromes, playing fields and tracks.Take these grass roots organisations away, as was the case in the middle of the twentieth century, and you've lost a dedicated labour and fund raising force right across the nation. 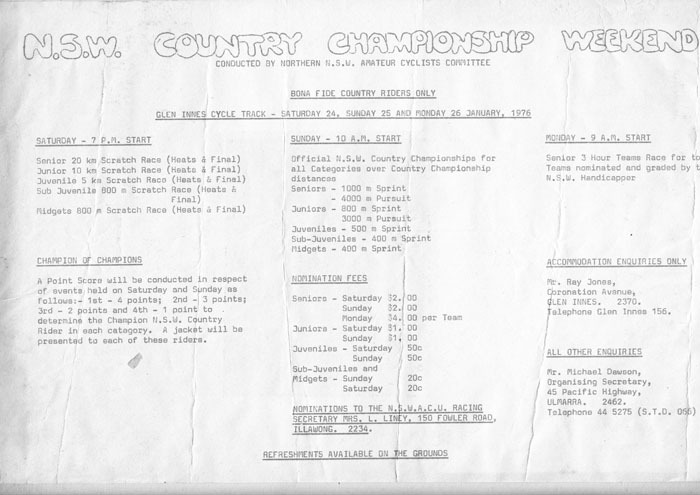 Sid Patterson invited to race at Echuca cycle races in 1954, organised by the Echuca and District Athletic Association. In Melbourne in the 1880's and 1890's the two colossal wheel races were the Austral Wheel race and the Australian Natives Association Wheel Race. Today the Austral survives, the A.N.A wheel race lost after the A.N.A disbanded, blamed on the advent of television. The Austral always in the hands of a cycling based body not a community based organisation like the A.N.A, perhaps one reason why the Austral is still running. By the 1970s' not all, but most of the track races promoted in Australia were in the hands of cycling clubs or cycling based organisations, the A.N.A, a large proportion of local sports clubs, Caledonain and Friendly societies fallen by the wayside. Simply put, community spirit which surrounded the "Sports" had died off, spectators no longer filled grandstands at showgrounds and race tracks, they stayed at home instead. When this form of sports promotion went into decline, some bike races they promoted ended with them. Gilgai is a classic example, no one left to promote Gilgai Sports also equals no one left to run and maintain the track, instantly one vibrant event ends and all the benefits to cycle sport disappears with it. Gilgai Sports was no longer on the calendar from the late sixties. This trend slowly occurred throughout the nation, the silent ghosted impressions of these racing tracks and empty velodromes, languishing in the back blocks as testament to the hard fought races once contested there. Some blame television as the catalyst for the change, but it probably comes down to a whole raft of social changes that shaped the habits of Australians from the mid 1950's onwards. Spending all day at your local sports ground watching runners, cyclists, or wood choppers for example just didn't cut it anymore. This left organising cycling events in the hands of those promoters that already had a vested interest in cycling alone. The legacy of the concept of all day "Sports" with a community focus, left it's mark on cycling carnivals until late in the twentieth century, and still resonates in pockets around the country today, significantly diminished but not lost entirely. The racing scene in 2014 is vastly different to just a couple of decades ago. If we use the demolition of Brisbane's Hawthorne Park as an example, the local club now conducts popular Criterium races on the nearby Murrarie criterium circuit and some club members use Chandler Velodrome. Some of the family day out atmosphere, which once surrounded events at Hawthorne Park Velodrome has transferred to the crit circuit, but Chandler today is no substitute for a proper old school race carnival at Hawthorne track. I see it this way, anyone can choose to get involved in so many more facets of cycling that did not exist twenty years ago. In the early 1980's I remember one morning in Sydney riding with some members of the St George club, we stopped for a novel idea, a coffee or tea, normally you just went training and ended up at home. Now anyone can buy a bike, ride it, drink coffee with their mates and never go near a bike race, back then the only people who rode bikes were racing cyclists and a few other intrepid journeymen. Cyclo cross, mountain biking, B.M.X, the fixie scene, road racing, crit racing, you name it there's plenty to do on a bike these days without going to an all day track carnival, and a lot of cycling activities now don't require affiliation with a club to enjoy the sport. Track racing in Australia can never go back to the all day "sports" carnival atmosphere, but with renewed interest in cycling, it will take it's own unique course for the 21st century. In Glen Innes a couple of well know cycle enthusiasts, Ray Jones and Ian Jacobs together with the Glen Innes Cycle Club were responsible for keeping racing going in that town towards the end of the twentieth century. This pair typical of another kind of community spirit which pervaded, the love of cycle sport in it's own right. Throughout the 1970's the venue seemed to have a new name at every race meet, including Glen Innes Cycle Arena, Glen Innes Cycle track and King George V Oval. The now defunct Glen Innes "Cycling Arena" reveals a rich history of country cycle sports. Glen Innes has had a cycling club, more or less since 1886, although every few years since then there has been a fresh announcement that "The Glen Innes Cycle Club has been re-formed". The Cycling Arena at King George V Oval, the local societies, town council and many permeations of the local cycling club all had their part to play in the one hundred and forty year history of cycle racing in Glen Innes. Most of the bike racing in Glen Innes from the 1880's until about 1925 was conducted either on local roads or around the Glen Innes showground. On Easter Monday 1887 Glen Innes Bicycle club hosted the second annual Sports Meeting, with the two mile Presidents Cup as the feature event. The very first Caledonian Society, Boxing Day sports meeting was held at the Glen Innes showgrounds in 1892, the meet featured cycle races. The Caledonian Sports Meeting on boxing day continued right up until the 1930's. Multi-sport events held in Glen Innes by the Caledonian Society included tug of war, running races, sheaf throwing, bicycle races, piping events, bagpipes and dancing, bullock riding contests, hammer throwing and wood chopping. Each Easter the local Friendly Society conducted their "Easter Sports" meets, which included a cycling programme run under the auspices of the New South Wales League of Wheelmen. The 1926 Friendly Society Easter Sports included the "Easter Gift 1 Mile Bicycle Handicap, Springers half mile Bicycle Handicap and 3 1/2 mile Bicycle Scratch Race." The move towards having a dedicated cycling venue in Glen Innes came at a critical town meeting in 1926. Prior to 1937, King George V Park and Oval was named South Park. "Glen Innes Sports Ground, Glen Innes Saturday. At the last meeting of the municipal council plans submitted by the Sports Union for the resumption of land for the conversion of South Park into a central sports ground were adopted. All preliminaries have been arranged to allow of the project being realised." When South Park was re - opened as King George V Memorial, the local cricket and hockey associations had filled and levelled the land, a picket fence was erected and the grandstand completed. There's no mention of a cycle track, however by 1953, in one of the many resurrections of the local cycle club, the track was mentioned. "A move has started to re-form the Glen Innes Cycle Club which has been in recess for more than four years. Cycle enthusiasts claim that at least 50 racing members are available if a suitable track is constructed. The Municipal Council will be asked to restore the cycle track at King George V sports oval." It's a fair bet that the initial cycle track at King George V Oval was completed in the late 1930's, given that it required restoration by the early 1950's. The next move came from a couple of dedicated club members, Ray Jones and Ian Jacobs, they were responsible for improving the velodrome, providing the banked version that we see remnants of today. I spoke to Jock Bullen who knew of their involvement with this phase of the work, presumably completed sometime in the 1960's, although Jock recalls racing back at the showgrounds at one time during that period. There was a sense of freedom belting down the tree lined back straight at Glen Innes Cycling Arena. It's ironic that at the opening of King George V Oval in 1937, Colonel Bruxner made his speech and imparted his wisdom on the unsuspecting local "Sports enthusiasts". Bruxner - "Deplored the present tendency to regard spectatorship as sport. Those who went in hundreds to a playing ground and sat in the grandstand smoking and watching a score or so of men playing were not indulging in sport." In 1956 with the advent of television lounge room chairs became the new grandstands of Australia, Bruxner had a point. While I sat and watched the rain fall on the dead King's oval, I'd wished I'd had a track bike with me and a someone to take a picture of me riding it along the rough eroded bank that once was a race track. I did the next best thing, and recorded the faded impression of a track that once provided a venue for thrilling race finishes. Now instead of a fever pitched crowd all I could hear was that alarm designed to scare off kids. Lost and Forgotten Tracks and Velodromes by Leon Simms on The Cycling Scrapbook where you'll find much more Aussie cycling history. 1926 1 November Glen Innes Sports Ground, Glen Innes Saturday. At the last meeting of the municipal council plans submitted by the Sports Union for the resumption of land for the conversion of South Park into a central sports ground were adopted. All preliminaries have been arranged to allow of the project being realised. 1936 25 May - A large public meeting decided to take steps to have South Park re-named The King George V. Memorial Park. 1936 October - A Queen competition raised £416 for improvements at King George V Memorial Park 1937 9 August Acceptance of a tender of £1094 for the construction of a grandstand and memorial entrance gates. The work will begin immediately. The committee is seeking a proclamation of a public holiday in conjunction with the official opening. 1937, 18th November King George V. Memorial Park declared open with a procession and sports carnival. 1937 19 November, Physical Training Scheme. Col. Bruxner Opens King George V Memorial Park. Last year an initial appeal resulted in the collection of £600 which was subsidised pound for pound by the state government. Colonel Bruxner deplored the present tendency to regard spectatorship as sport. Those who went in hundreds to a playing ground and sat in the grandstand smoking and watching a score or so of men playing were not indulging in sport. After 1953 Glen Innes Cycle Club with Ray Jones and Ian Jacobs raised funds to build the velodrome as seen in the picture. 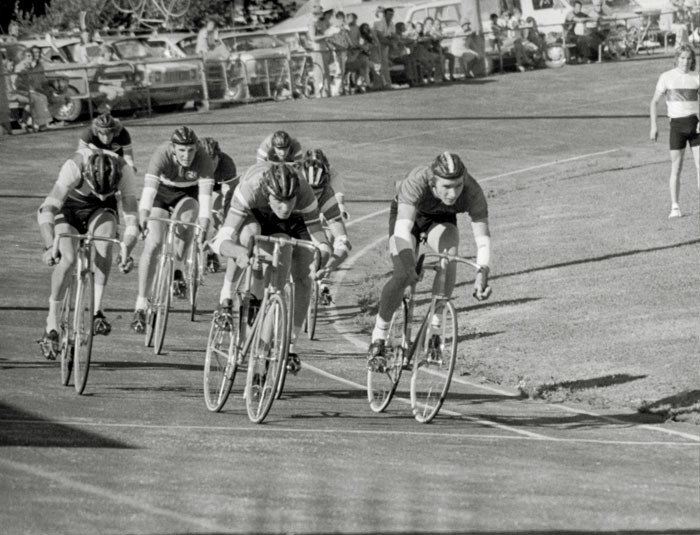 1970's Many race meets held at Glen Innes Velodrome, a vibrant racing scene. 2009 18 March Office of Tony Windsor "$60, 000 to re-turf velodrome area at king George Oval in Glen Innes" 2009 28 April Glen Innes Council Considers Infrastructure Costs "There's an old velodrome that currently goes around that oval. Council will be able to dismantle that and set it out as a number one oval." Friendly Society Sports Easter Sports 1925 Glen Innes Easter Sports included running and bicycle races. 1926 April Held at the Showground, Easter Gift Bicycle Handicap 1 Mile, Springers Bicycle Handicap half mile, Bicycle Scratch Race 3 1/2 miles." (20) "Glen Innes Carnival. In connection with the carnival at Glen Innes on Easter Saturday, cycling events under the control of the League of Wheelmen will be held. The prize money is Easter Gift (1 Mile), 20 Sprinters Handicap (Half Mile) 8 and Scratch race 3 1/2 miles 2/10 and trophy, with lap prizes. Glen Innes Cycling Club 1887 April 11 - Glen Innes B.C Second Annual Sports Meeting. GLEN INNES B.C. - The club seems to be showing considerable vitality, and has arranged for a race meeting for Easter Monday next ; the principal event being the President's Cup Two Miles Bicycle handicap. If any Sydney men can get away for a holiday at that time they would do well to encourage the club by a visit. 1895 - 7 September, GLEN INNES, Friday. A bicycle club has been formed here, which it is proposed to affiliate with the New South Wales League of Wheelmen. Mr. R. J Lewis, the well known cyclist, who has been touring the north, is interesting himself in the movement. 1896 July, CYCLING - Glen Innes sports meeting has been postponed to some date next month due to a fall of heavy snow. 1902 - May, A strong cycling club has been formed at Glen Innes, and it is intended to hold a sports meeting on May 14. Some of the best northern riders are expected to be among the competitors. 1903 - May 14. A race meeting was held at Glen Innes on Wednesday afternoon on the local showground. Novice Handicap, Half Mile Handicap, One Mile Handicap, Glen Innes Wheel race. Mile Championship of New England, Boys Bicycle Race. Races won by Hillgrove, Armidale and Glen Innes cyclists. 1906 April - The following are the handicaps declared for the half-mile, three quarter-mile, and the mile race to be run on the 16th instant at Glen Innes. 1923 August. Glen Innes Club, The Course was two miles along the Armidale road and back. Time 10 min 17 seconds. 1926 October - Cycle races at Glen Innes included a 1 Mile race, Half Mile, 1 Lap Dash and Three lap race. 1932 AprilThe Glen Innes Cycle Club has been re-formed 1953 31 October A move has started to re-form the Glen Innes Cycle Club which has been in recess for more than four years. Cycle enthusiasts claim that at least 50 racing members are available if a suitable track is constructed. The Municipal Council will be asked to restore the cycle track at King George V sports oval. 1970's Glen Innes Cycle Club, organised by Ray Jones and Ian Jacobs. The Velodrome was known variously as Glen Innes Cycle Arena, Glen Innes Cycle track and King George V Oval. Below, old race programmes from the 1970's. Like so many cyclists I'd stored these away for decades. Inverell hosted their race meet at Glen Innes Velodrome in November 1978, the following year they held their first events on the new track at Inverell.